Who can vote and how can they do so? 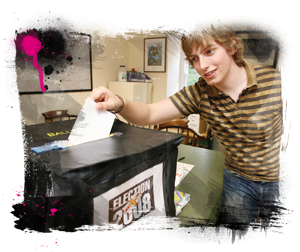 Voters must be aged 16 years or over on election day and must be on the Electoral Roll. How do you get on the Electoral Roll? The Electoral Roll is maintained by the Committee for Home Affairs. A few weeks before the election, candidates will send you a manifesto. This is a document which sets out their views on matters which affect the States and islanders. Some candidates might use social media and websites to publish their views and manifesto; the Guernsey Press also publishes information about the candidates. Some candidates will visit your home. This is your chance to ask them questions about the issues which affect you. Some candidates might ask if you will vote for them, but you don’t have to tell them – your vote is secret. You can vote at a polling station or by post. Most voters enjoy the experience of voting in person at the polling station, however, for some people it’s more convenient to vote by post. In each of the Electoral Districts there are two or more polling stations. You may vote at any of the polling stations in your district but you can only vote once. Your name and address will be checked on the Electoral Roll and you will be given a ballot paper. You then go into a polling booth so that no one can look over your shoulder as you vote. The names of all of the candidates in your Electoral District will be listed on the ballot paper. You put a cross next to the name of each candidate you wish to vote for. Depending on which Electoral District you live in, you can vote for five or six candidates, although you do not need to use all of your votes if you do not want to. When you have finished marking your ballot paper, you fold it in half and put it on the locked ballot box. When the polling stations have all closed, the boxes will be unlocked and the ballot papers will be counted. The five or six candidates who receive the most votes in each Electoral District become our new Deputies and serve in the States of Deliberation for the next four years.